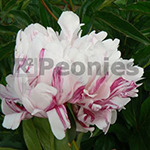 Candy Stripe is a special Peony with beautiful white flowers and purple red stripes all over the flower. This peony is a collectors item. There’s no one almost the same as this beauty. With the slight fragrance is Candy Stripe blooming in the middle season. This Peony or Pfingsterrosen is used a lot for cut flower production as well for landscaping in gardens and city parks all over the world.